Payufu Oak dining tables are durable, attractive and classy. They can be added to all types of dining areas, regardless of the interior decor. They are found in farmhouses in the countryside as well as in the upscale city apartments. For centuries, wooden furniture pieces are used for adorning the dining rooms. Among the different types of timbers used for constructing furniture, oak is preferred for its strength and hardness. The oak dining furniture can last for several generations. The four-legged rectangular table is the most attractive dining table design. Readily available in oak furniture stores, they are designed to suit traditional as well as contemporary dining room designs. Apart from tables with solid wood surfaces, four-legged dining tables also come with glass tabletops or with tabletops inlaid with glass. The trestle and mission tables are attractive alternatives to the conventional four-legged dining table. Oval or round tables are ideally suited for small dining areas. Dining table with round pedestal gives a classy touch to your dining room decor. Oak dining tables come in a variety of finishes and color shades. To give your dining room decor a rustic touch, consider buying an untreated dining table. The traditional harvest or farmhouse tables are best suited for rural dwelling, where they blend with the natural surrounding of the countryside. The lacquered tables require the least maintenance. The drop leaf dining tables can be extended to accommodate additional diners. With options aplenty, you can quickly find an appropriate dining table in an online oak furniture store. While shopping for such tables, shoppers should take into account the size, shape and capacity of the table. 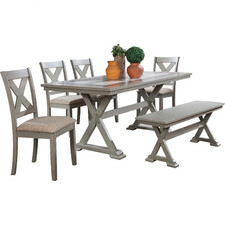 For a large dining area, you will require an eight to ten-seater dining table set. Many people love the look of massive dining tables. While they can indeed look great, you should make sure you are purchasing them for the right reasons, not just to take up space. Have you ever seen homes where there is a long dining room table with just one person sitting at each end? That is just awkward! Instead, get to know what you need and the space you have. If you have a large dining room, fantastic. Now consider the meals you are going to be serving and how many people will be in attendance. Make sure you get a table that will suit those needs. For your kitchen area, opt for small two to four-seater bistro tables. Tables with rounded edges are perfect for families with young children. The finest quality oak dining tables are made out of English oak. It is the hardiest variety of oak timber. Despite its hardiness, English oak can be crafted easily. In a reputed oak furniture store, you will come across a wide range of English oak furniture.